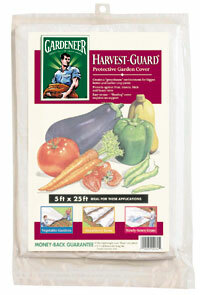 Harvest Guard fleece protects vegetables against frost both in the spring and in the fall. Harvest Guard can be used to protect plants from song birds which can sometimes be a pest. Valuable songbirds such as Cardinals nibbling on ripe tomatoes and Catbirds stealing your blue berries. Easy to use - "floats" over crops without support , while it lets water, light, and air through to the plants. Use Harvest Guard fleece on vegetable gardens, strawberry rows, and young seedlings or transplants. It can also use on newly-sown grass to improve germination and protect seed against birds. - Prepare garden plot and plant seeds, seedlings, and young plants. - Unfold Harvest-Guard® Cover to desired length (cut in sections if necessary). - Drape cover loosely over seed bed or plants to allow plenty of slack for plants which grow upright (like tomatoes and peppers). What is Harvest-Guard used for? What are the benefits? If it keeps insects off, what about pollinating insects? Some plants must be pollinated for fruiting, such as early peas, zucchini, or any flowering fruit-bearing plant. Insects, especially bees, are the agents to see that this happens. You MUST remove the fabric every few days to be certain that pollination will occur. Can you double layer Harvest-Guard for added protection against frost?